had a powerful vision as a tiny child of the wrathful protector Mahakala and told many stories of his previous lives. He was recognized at the age of four and enthroned by Gyaltsab Rinpoche. At the age of eight, he met his main guru, the great eighth Situpa Chokyi Jungne, whose long life had spanned all of the twelfth Karmapa's and was to span most of the thirteenth's. Dudul Dorje received the Kagyu transmissions from him and also studied the Nyingma teachings very extensively. He was very fond of animals and famous for his ability to communicate with them. At one point the Jokhang temple, home of the famous Jowo image in Lhasa, was threatened by rising flood waters. 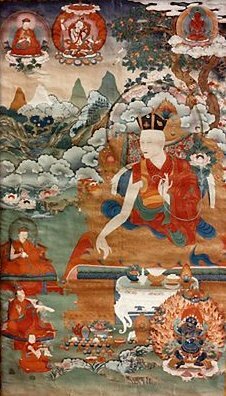 A prophecy from Guru Rinpoche had foreseen this and predicted that only the Karmapa could do something to stop it, as it was caused by a powerful serpentine spirit (naga). The Lhasa authorities requested him to come. Being unable to leave immediately, he resolved the problem by writing a special letter to the naga and invoking the compassion of Avalokiteshvara. On arrival at Lhasa, the thirteenth Karmapa offered a white scarf (kata) to the Jowo image, and the arms of the statue changed position to accept it. They have been that way ever since. Dudul Dorje was also asked to consecrate a distant monastery. Unable to attend, he threw blessing grains in the air at Tsurphu at the moment of the consecration ceremony, and they were seen to shower down from the heavens hundreds of kilometers away at the monastery in question.